There is a wide assortment of Las Vegas French restaurants which boast something for all type off diners from romantics to foodies to value hunters. 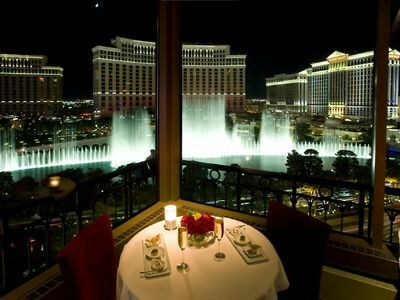 For romantic diners the price fix menus at Guy Savoy as well as Picasso are perfect and Le Cirque offers a great view of the Bellagio Fountains. 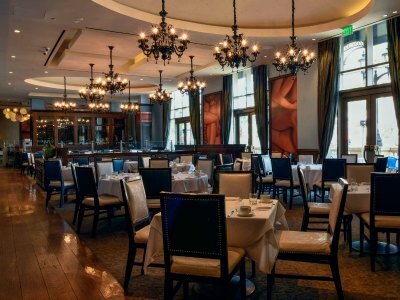 A la carte menus can be found at BARDOT Brasserie or Bouchon at the Venezia Tower and you can find value at Mon Ami Gabi as well as Morels French Steakhouse Bistro for all three meals. If you want to feel like you are in Paris with a view of the Bellagio Fountains then the Eiffel Tower is ideal. If you are a foodie who wants to experience creations from the number one chef in the world then try the gastronomic delights at Joel Robuchon or L’Atelier de Joël Robuchon where you can interact with the chefs. When you want to dine at a Las Vegas French restaurant that will remind you of a French bistro with classic dishes then an excellent choice for you is the Mon Ami Gabi. Located at the Paris Hotel, the establishment is situated directly off the Strip across from the Bellagio Fountains and features an interior of stained glass, arched bay windows as well as lots of wood and serves all three meals including brunch specialties. Breakfast/brunch is popular here with crepes, waffles, numerous egg dishes and several versions of eggs benedict are a big hit. Lunch brings an assorted menu from house made country pate to several quiches to skate wing to a delectable prime steak sandwich. Dinner boasts classic dishes such as beef bourguignon, plenty of classic steaks, trout almondine and the wild escargot de Bourgogne is a must for a starter. If you want to be transported to a bistro in France that serves quality cuisine with value then a superb Las Vegas French restaurant for you to visit is the Bouchon at the Venezia Tower. 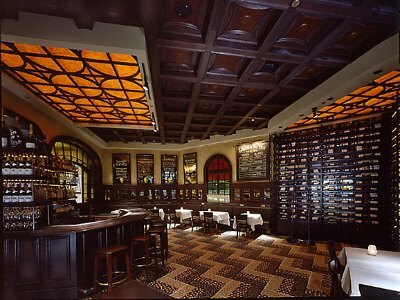 Located within the Venetian, the establishment has an upscale ambience that is reminiscent of a cafe in France with wall murals, mosaic tile floors, antique lights and a pewter bar. Created by famous chef Thomas Keller the restaurant is open for breakfast/brunch and dinner with an eclectic a la carte menu which pleases the diversified crowd of diners. Breakfast/brunch brings a mixture of classic egg dishes, sandwiches like the tartine du jour, crepes and the beignets are superb. Dinner offers a raw seafood bar, salmon tartare, macaroni d’homard, gnudi aux truffles and the croquet madame is a must have item that is on both menus. If you are interested in a spectacular view of the Strip and the Bellagio Fountains as well as being transported to France then an ideal Las Vegas French restaurant for you is the Eiffel Tower. Located in the Paris Hotel on the eleventh floor of the famed Eiffel Tower structure, this establishment gives you the pleasure of an obstructed view of the dancing fountains of Bellagio through floor to ceiling windows. 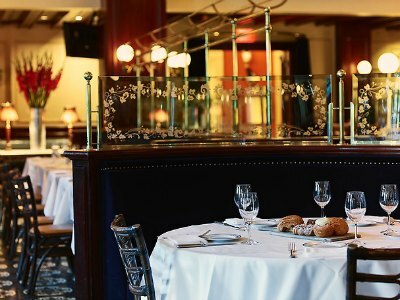 The restaurant is open for lunch, dinner and weekend brunch serving an a la carte menu that brings an assortment of caviars, cold foie gras torchon, lobster benedict, a Moroccan style lamb burger and the Eiffel Tower beef Wellington is a must try. If your whole table can agree you can also try a tasting menu that features eight courses of delectable cuisine. If you have room for dessert the chocolate souffle is the go to item. One of the more entertaining Las Vegas French restaurants to hit the scene in years with food conceived by renowned chef Joel Robuchon is the L’Atelier de Joel Robuchon. 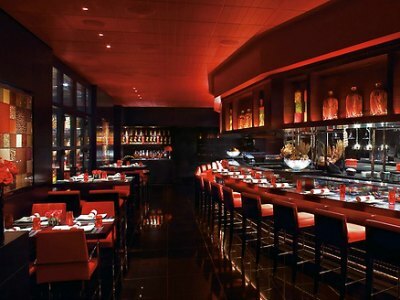 Located within the MGM Grand, this restaurant has an interactive ambience with an interior of dark wood, glass, polished stone which are highlighted by lots of red. Open for dinner only, Robuchon brings his creative culinary mind to the forefront in an open kitchen format that allows you to watch and interact with the highly trained chefs while they prepare your meal. There is a superb system which allows you to create your own tasting menu from two to sixteen courses that include signature items like le jambon, la kampachi, le tournedos, le homard and decadent desserts like le cerise. When you are finished with your meal you will know that you just experienced something special that only Robuchon can create. One of the best three Michelin star Las Vegas French restaurants as well as in the world which serves enticing and innovative cuisine is the Joel Robuchon also known as the Le Monde de Joel Robuchon. 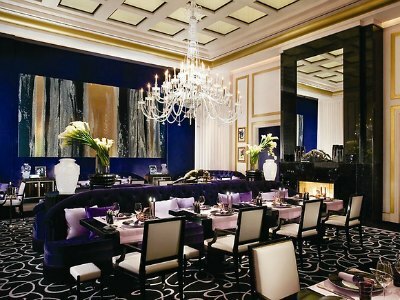 Located within the MGM Grand, the restaurant is situated in an Art Deco mansion which features an elegant dining room of subtle colors which are accented by Art Deco furniture and is open for dinner. Most diners choose one of the seasonal tasting or degustation menus where you can add more tiers of the sinful cuisine that only Robuchon can create. 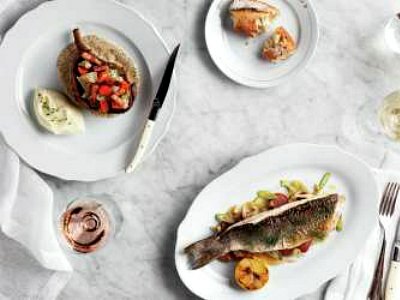 Some of the highlighted dishes are the le Homad du Maine, la cuisse de grenouille, la langoustine and Le Saints Pierre. The bread and dessert carts are masterfully created with indulgence. No matter what you choose to eat your taste buds will know the specialty of the cuisine that you just experienced. The Picasso is an ideal Las Vegas French restaurant for upscale diners who want to experience the classic flavors of France accented with delicacies from Spain. 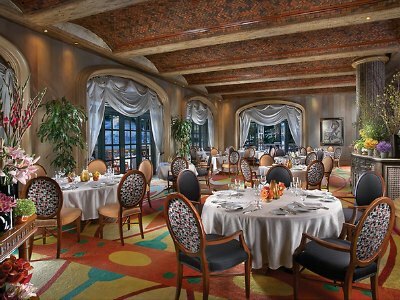 Located within the Bellagio, the restaurant has an elegant European style dining room with Picasso paintings on the wall and a view of the Bellagio Fountains as well as the Eiffel Tower from the outdoor patio. Open for dinner only, they serve several seasonal price-fix menus which range from three to four courses and a vegetarian option which serves pre-theater as well as leisurely diners. Some of the highly regarded dishes at the restaurant include foie gras au torchon, roasted milk-fed veal chop, Maine lobster salad as well as a roasted tournedo of Colorado lamb and a plancha Chinese eggplant dish for vegetarians. Desserts that dazzle are the banana French toast and the sauternes poached pear. If you are looking for a Las Vegas French restaurant that brings the image of an original Parisian cafe which serves innovative French comfort cuisine then the BARDOT Brasserie is perfect. Located within the Aria Resort and Casino, the establishment boasts an interior of dark wood, lots of glass and leather chairs that provide a classy atmosphere for lunch, dinner as well as weekend brunch. The restaurant has a la carte menus which feature standout dishes such as the raw seafood bar, escargot BARDOT, foie gras parfait, Maine lobster bisque, black truffle French fries and Parisian gnocchi as well as Maine lobster nicoise chop at lunch. Brunch offers a bottomless glass of rose wine as well as nice hunter’s waffle. If you are looking to try before indulging heavy then the happy hour menu is perfect with several tartare dishes, sandwiches and drink specials. If you are searching for a romantic upscale Las Vegas French restaurant that offers a wide selection of tasting menus at various price ranges then Le Cirque is an ideal choice for you. 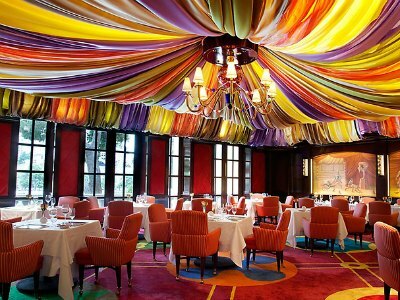 Located in the Bellagio, the restaurant features a bright multi-colored dining room with a view of the Bellagio Fountains and is open for dinner. Diners will be pleased with the variety of price-fixed menus that change seasonally which range from a pre-theater three course meal to a ten course prestige cuisine tasting and there is a vegetarian option available. Signature dishes at the establishment include chocolate coffee bread, Japanese yellowtail, rabbit symphony, carnaroli risotto with truffles and dessert offers a decadent chocolate ball. Wine pairings are available for all price-fix menus which will enhance your experience. The service does not miss a beat and keeps up with the spectacular cuisine that is prepared. The Guy Savoy is the best Las Vegas French restaurant for diners that want to experience a Michelin moment while tasting magical cuisine. Located within Caesars Palace, the establishment is fashioned after the Guy Savoy in Paris which boasts a sleek contemporary decor and is open for dinner. Once you arrive you will notice why this a dining experience which will take your taste buds to a new level of happiness. 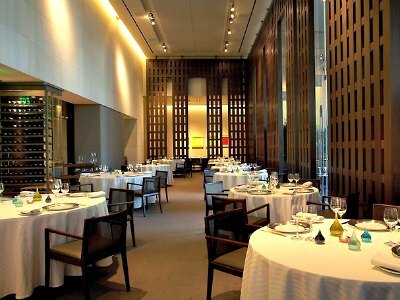 Signature dishes such as the artichoke and black truffle soup as well as the foie gras are a must to try. Other innovative tasting menus bring delights like caviar, grilled veal sweet bread; roasted California squab and grilled venison tenderloin to your table. There is immaculate tableside presentation throughout the meal from the bread cart to a dry age pineapple dessert roasted in a clay pot and the novel size wine list will help you find a perfect wine. Morels French Steakhouse and Bistro is a perfect Las Vegas French restaurant that receives high marks for service and quality of cuisine. Located within the Palazzo, the restaurant’s ambience is ideal for a romantic or client based meal and is open for all three meals as well as weekend brunch. Standouts for breakfast include an imported mushroom souffle, banana foster pancakes, the bottomless mimosa and a handcrafted bloody Mary cart that pours tableside. Brunch is served from an a la carte menu with the raw seafood bar and the French dip sandwich receiving high marks. Dinner brings over 60 cheeses and hand crafted meats, a raw seafood bar, wet and dry-aged steaks with items like the onion soup gratinee, braised short rib and the almost famous mac and cheese are favorites. They also serve over 60 wines by the glass and a nice banana foster for dessert.